AGI Industries is a safety-minded pipeline fabrication company that has developed the first pipeline pig loader dubbed the Safeway Pig Loader. Injuries are common when a push-rod or pig slips while forcing a pig into an open ended pipeline. The one-of-a-kind Safeway Pig Loader will eliminate this hazard. 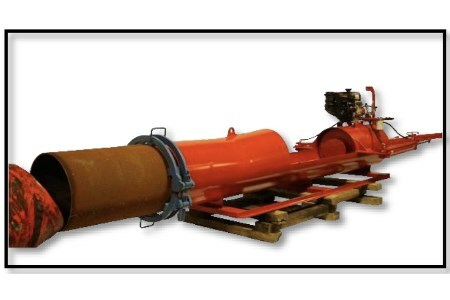 The truly innovative Safeway Pig Loader is the best and safest way to introduce a pig into any pipeline that requires cleaning, unclogging, or preparation for batch treatment processes, hydro-static testing, and other various types of structural integrity testing. This ingenious device enables operators to easily achieve the preparatory step of loading a pig into an open ended pipeline in a safe, clean, and efficient manner. AGI Industries’ fully mobile Safeway Pig Loader is available in eight convenient sizes ranging from 4 - 36 in. dia. and includes a standard gas engine and hydraulic supplement; other sizes are available upon request. In 30 min. or less and with a few easy steps, any typical poly or brush pig can be condensed and injected into an open ended pipeline with the new Safeway Pig Loader. Pig or push-rod slips are now a thing of the past when using this completely self-contained unit.